3chambres, 2Bath, Héberge8, très bien situé! À pied de la plage Sombrero! Belle et privée de 3 chambres (Master King, Queen Guest, Guest w / 2 lits jumeaux), 2 salles de bain maison, pour 8 personnes avec tout nouveau canapé-lit! Détendez-vous dans le bain à remous sur le pont arrière couverte ou démissionner à la piscine absolument privé et luxueux (chaleur disponible avec supplément). jardins tropicaux font toute la cour une oasis isolée, avec beaucoup d'espaces extérieurs pour profiter. Fabuleux quai du canal dans votre propre cour! Promenade à la plage juste en bas de la rue ou sauter sur la piste cyclable qui passe juste devant l'avant de la propriété et de faire un tour autour de l'île! Tout le monde est d'accord cette maison est très propre et confortable. Vous êtes sûr d'être tentés de rester pour toujours! Overall nice house. Pool outside area was awesome. The hot tub stopped working on our 3rd day there and they couldn’t get anyone out to fix it until the night before we left, didn’t offer any comp or other suggestions so that was annoying. The check out time is 10am and I understand that but at 959 the cleaning person knocked on our door and asked if we were leaving followed almost immediately by a text and phone call from the property manager reminding us to leave. We were literally getting ready to climb in the car and were off the property by 1015, again annoying. Pool was dirty we cleaned it daily, lawn people left out rakes and bins in the yard. The pictures aren’t accurate, not sure if they were taken prior to the hurricane but a lot of the large privacy trees aren’t there, sitting area under the deck also not there. Beds were awesome and house was clean, cockroaches in the dishwasher but it’s a beach house. The beach is having construction done so it was a much longer walk bc you have to go to the end of the beach to access, would have been nice to have the construction mentioned. I understand has nothing to do with the house but a heads up would have been cool. Overall house was great and good location. Backyard an oasis! Loved it! Absolutely loved staying at Tropical Temptation in Marathon! The pool and hot tub area were just devine and the tropical foliage surrounding the pool made the area a true oasis! The location was excellent...a few minutes walk to beautiful Sombrero Beach and about a mile and a half from the grocery stores. The amenities of the home were great! Plenty of pots and pans, large gas grill, etc. Would love to return! We enjoyed every second of our stay. The house was very clean and had everything you need including extra towels. 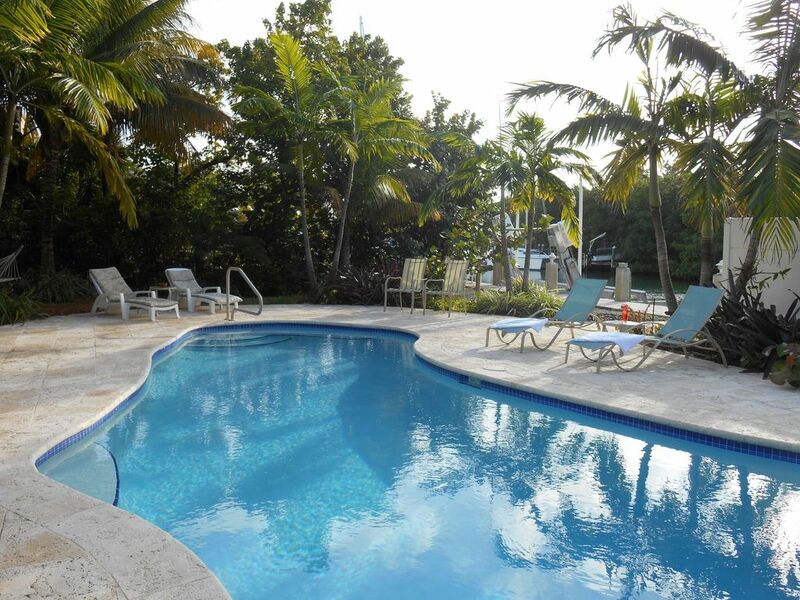 The yard and pool area is absolutely breathtaking with well maintained palm trees and other tropical bushes. Questions to the owner were awnsered within minutes. We can’t think of anything negative- loved it! We would absolutely recommend this property! Wow we love your review! Hopefully we will see your family again on your next Keys get-away! Wonderful home with a backyard so nice you don’t need to go to the beach. Can’t say enough about this property. Would stay here again on the future. Short walk to the beach, great canal access for the boat, pool was lovely and hot tub too! What a beautiful home. We did have a few hiccups but the property managers were quick to respond and take care of it. The location was perfect for everything we had planned. The only real drawback I had was with the trailer parking. The drive is very narrow and lined with palm trees, so it was quite a challenge parking the trailer for the week. But don’t let that stop you from staying here. It’s a nice leisurely ride to the Atlantic by boat. You can even catch some decent fish along the way. We had manatees hanging out several times also.